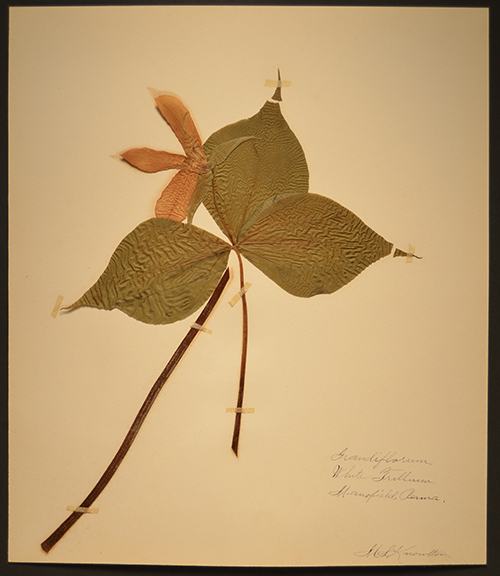 Trillium, Wake Robin, Mansfield, Pa.
Smilacina, False Solomon's Seal, Mansfield, Penna. 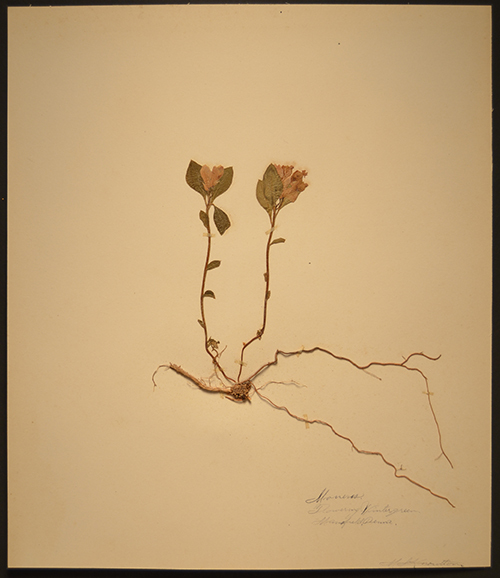 Epigaea Repens, Trailing Arbutus, Mansfield, Penna. 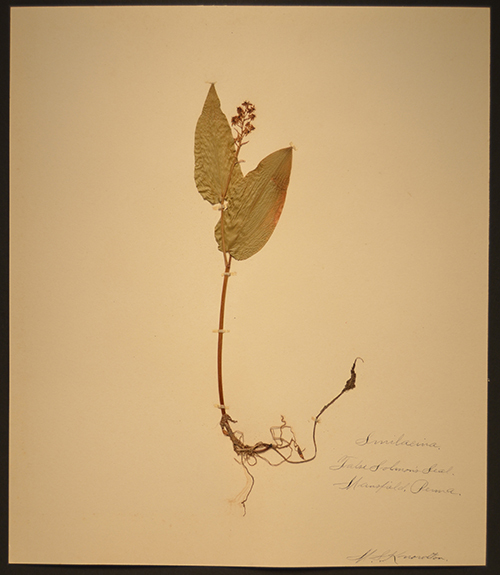 Polygonatum, Solomon's Seal, Mansfield, Penna. 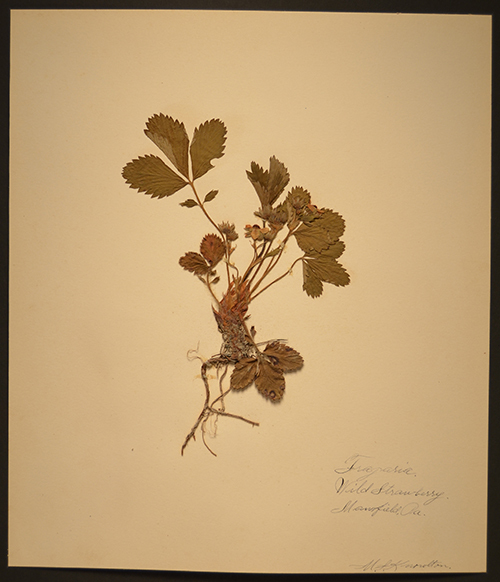 Fragaria, Wild Strawberry, Mansfield, Pa.
Grandiflorum, White Trillium, Mansfield, Penna. 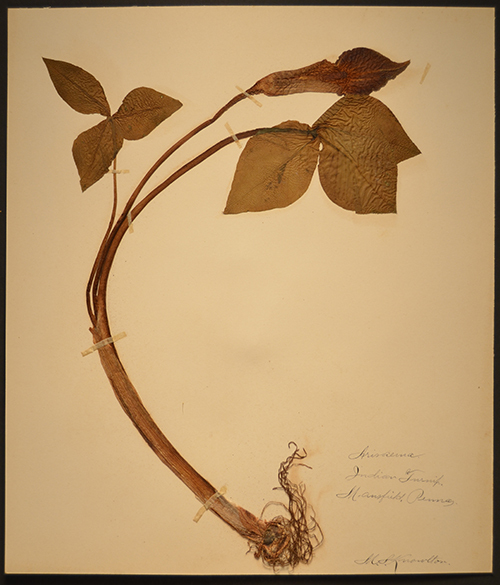 Moneses, Flowering Wintergreen, Mansfield, Pa.
Arisaema, Indian Turnip, Mansfield, Penna. 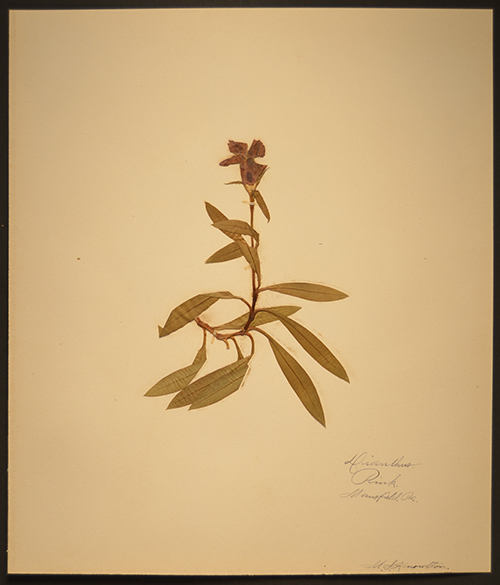 Viola Cucullata, Blue Violet, Mansfield, Penna. 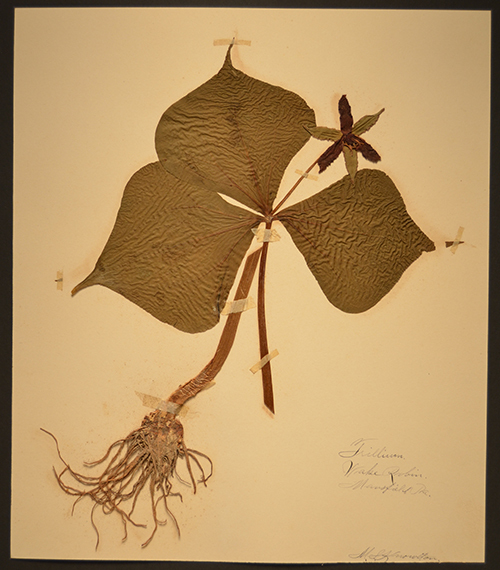 Podophyllum, Mandrake, Mansfield, Penna. 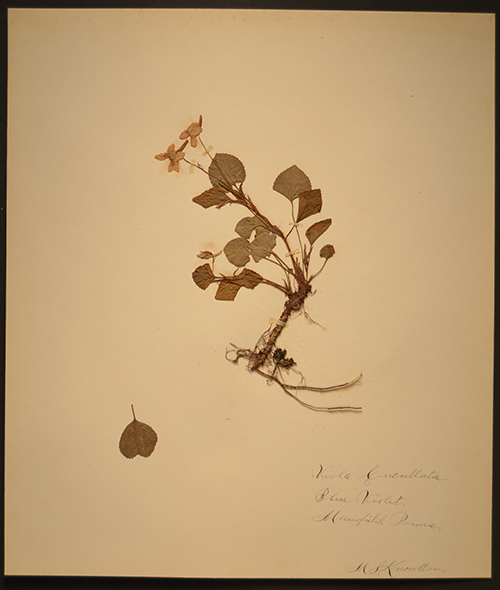 -- Viola Tricolor, Pansy, Mansfield, Penna. 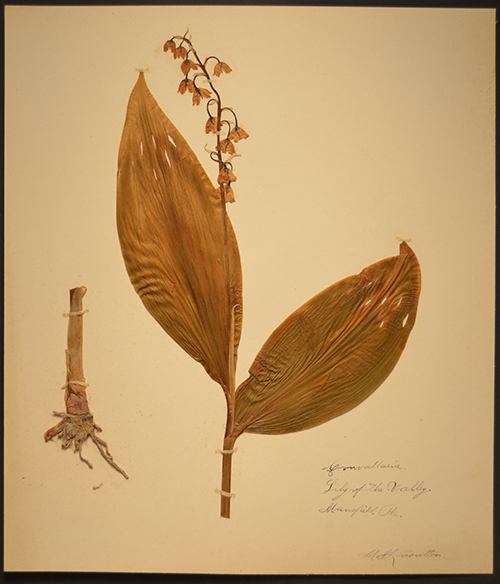 Convallaria, Lily of the Valley, Mansfield, Pa.
Claytonia, Spring Beauty, Mansfield, Penna. 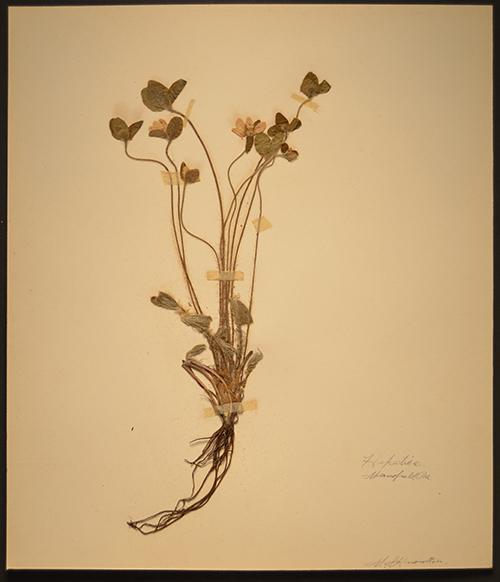 Viola Pubescens, Yellow Violet, Mansfield, Penna. 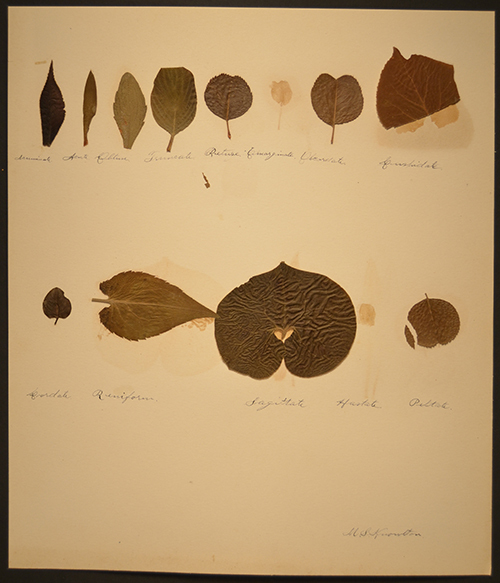 In Fall 2015, the Herbarium inspired John Shanchuk to create an assignment for his class. 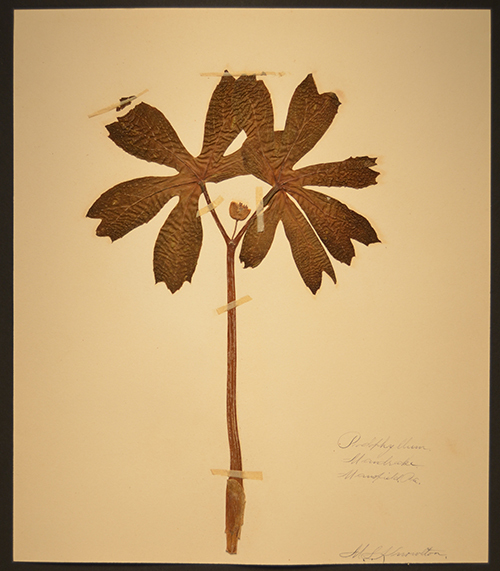 The students in his Digital Imaging and Illustration created a Digital Herbarium, seen below. Many thanks to the students for giving us permission to post their work here on the website. The final project was printed out and bound into a small booklet. 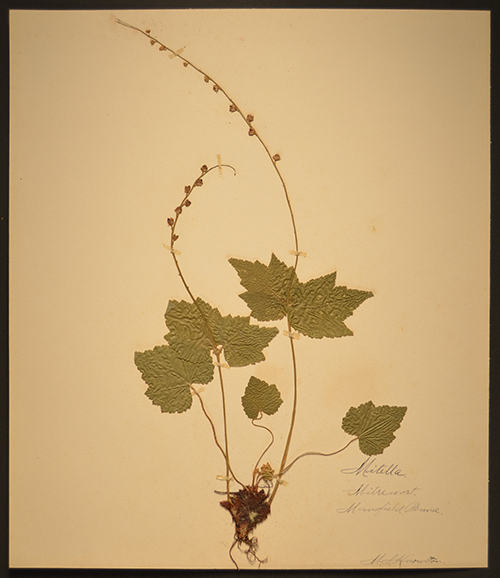 In Spring 2016, Librarian Sheila Kasperek began looking to see if the flowers in the Herbarium could still be located in the area. 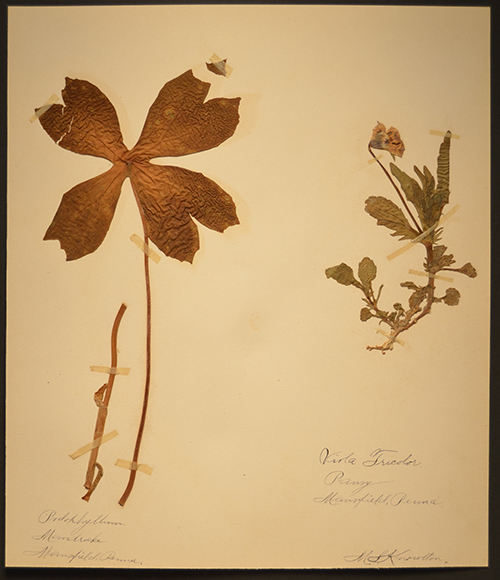 As an amateur botanist, she has been identifying local wild flowers for years. While she could not locate all the flowers in 2016, most have been available in recent years in and around Mansfield. The photos to the right show wild flowers sought out specifically for this project and images from previous years of wild flower hunting. In addition to these photos, a Deptford Pink was spotted on June 26, 2016 in Tioga County. A photo is not available as the flower was spotted during the Liberty Blockhouse bicycle race. 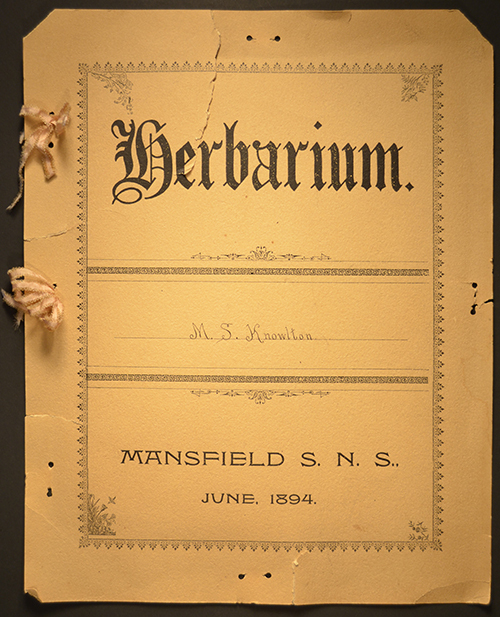 The Herbarium was donated to Mansfield University in July 2015. It appears to be a class assignment from June 1894 by Matthew Scott Knowlton who was in the Senior Class of the Elementary Program of Mansfield State Normal School in 1893-1894. 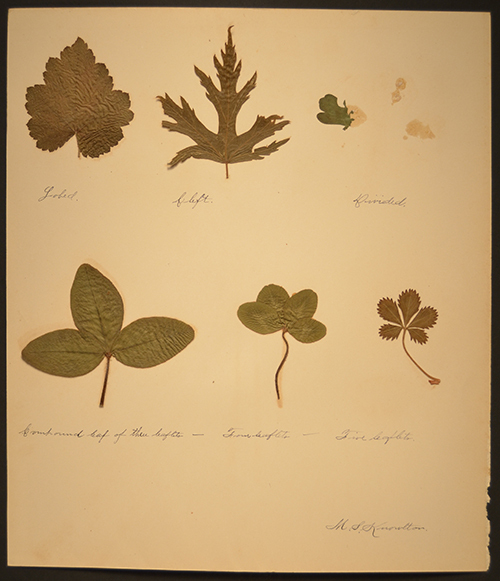 The Herbarium is a collection of pressed leaves and plants from the Mansfield, Pennsylvania area. 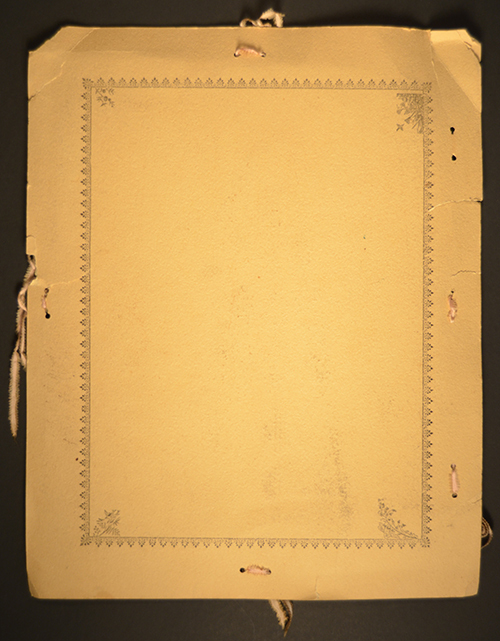 It contains twenty-five individual pages of card stock with plants adhered to them. These single cards were enclosed in a cover tied together with ribbon. The collection is very delicate, as you can imagine, having survived over 120 years in private hands. 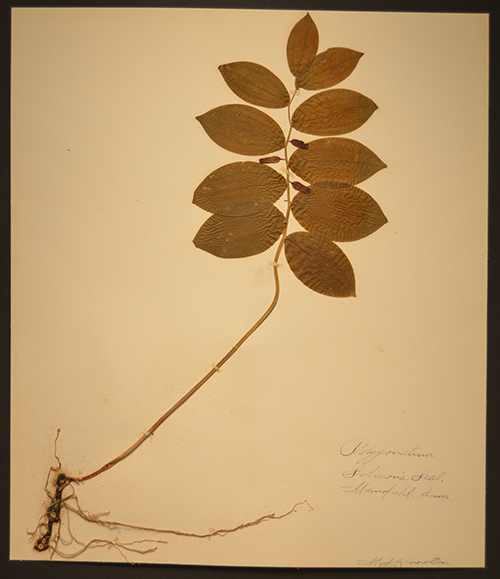 The Herbarium was located at the estate sale of Robert Van Dusen of Elmira, New York, in July 2015 after his death earlier in the year. 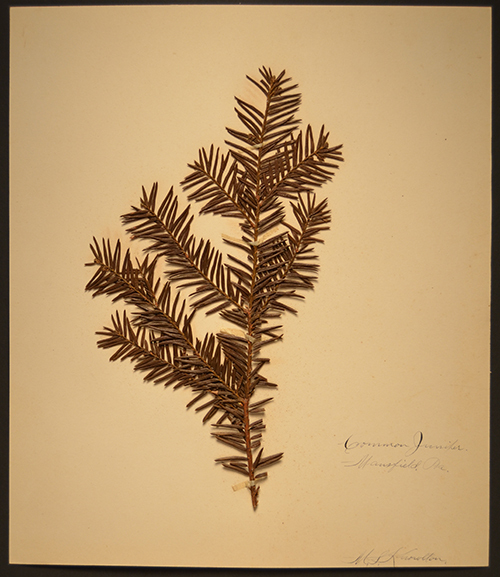 It appears that Matthew S. Knowlton, creator of the Herbarium, passed it along to his eldest son, Leon C. Knowlton. Leon passed it along to his only child, Evelyn Margaret “Peggy” Knowlton Van Dusen. It remained with her husband Robert's estate after her death in 1989. 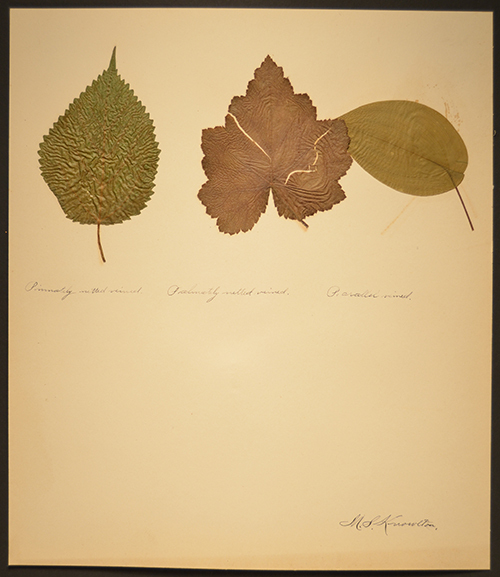 The Herbarium was purchased at Robert Van Dusen’s estate sale and then donated to Mansfield University by Denise DeLosa who felt such an interesting item should be preserved. 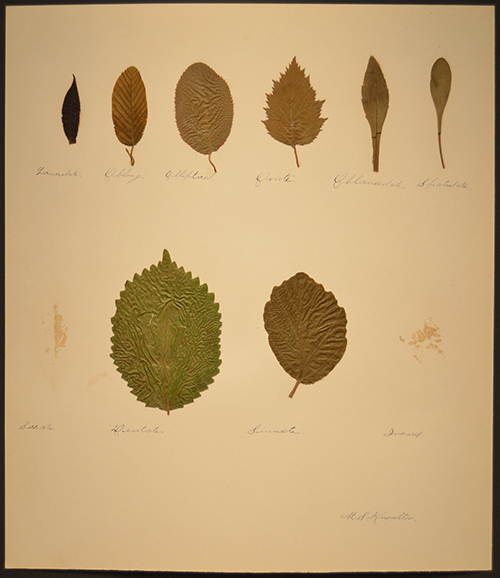 We are honored that Mrs. DeLosa passed along the Herbarium to us. 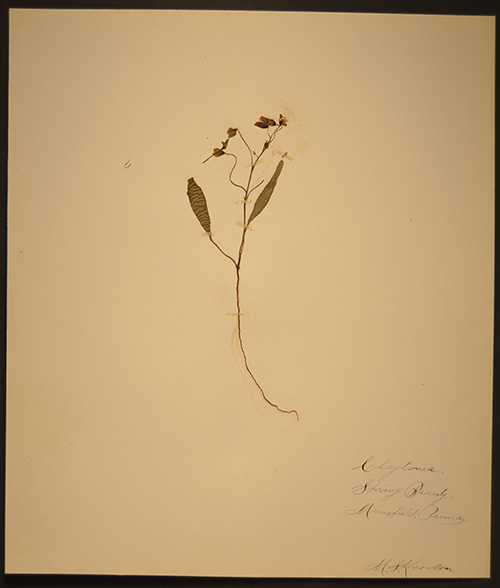 Matthew S. Knowlton was born in 1868 in Covington, Pennsylvania, to Hanover Pitts Knowlton and Sarah Phillips, and lived in the area until his death in 1953. He attended Mansfield State Normal School, graduating in 1894. He taught in Covington Township from at least 1903 to 1911 and later became a farmer. He married Martha Rose Marvin in 1891, and they had six children, two of whom, including Leon, eventually became teachers. Granddaughters Evelyn Knowlton and Doris Knowlton and grandson Clyde Knowlton also attended Mansfield State College. 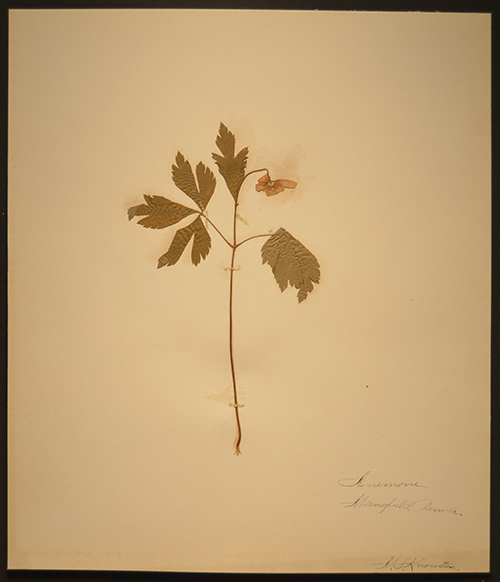 Some of Matthew’s descendants still live in Mansfield and Tioga County, PA.
Leon C. Knowlton, the presumed second owner of the Herbarium, was born in 1896. He served in World War I and worked as both a teacher and a farmer. He married Jennie Everts, and they had one child, Evelyn Margaret “Peggy” Knowlton. Leon died in 1984. Evelyn Margaret “Peggy” Knowlton was born in 1921. She graduated from Covington High School in 1939 and attended Mansfield State College in at least 1941. She became a teacher, working at both the Booth School and the Hoffman Street School in New York state. She married Robert Van Dusen in 1945 and they had at least two children. 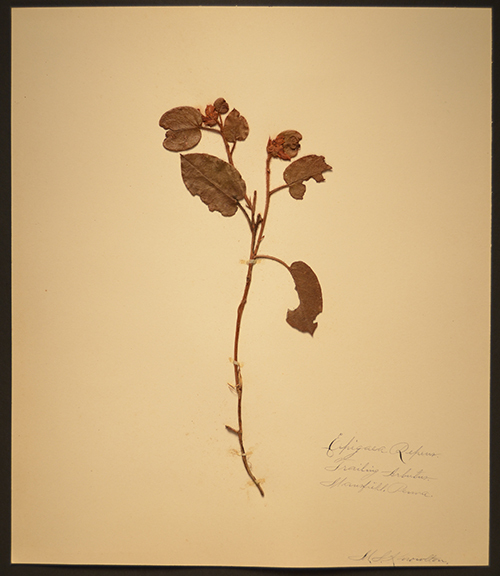 Evelyn Margaret “Peggy” Knowlton Van Dusen died in 1989. 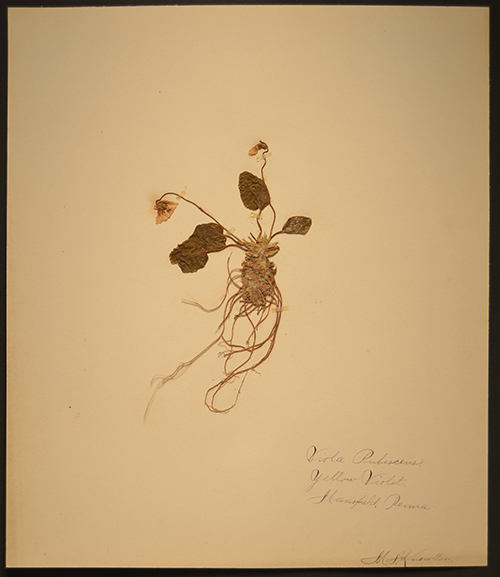 The physical item is currently unavailable for viewing because of its delicate condition and the presence of mold on some of the plants. Please enjoy these photos, taken by Art Department faculty member John Shanchuk. 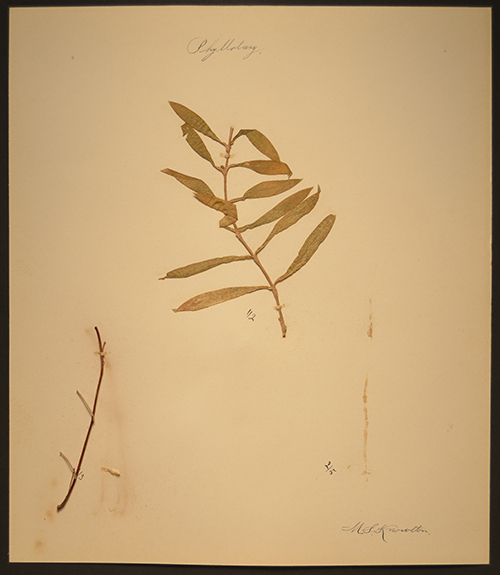 Many thanks to the Mansfield University Archives, Mansfield University Alumni Association, and the Mansfield History Center website for their help in researching the legacy of Matthew Scott Knowlton. 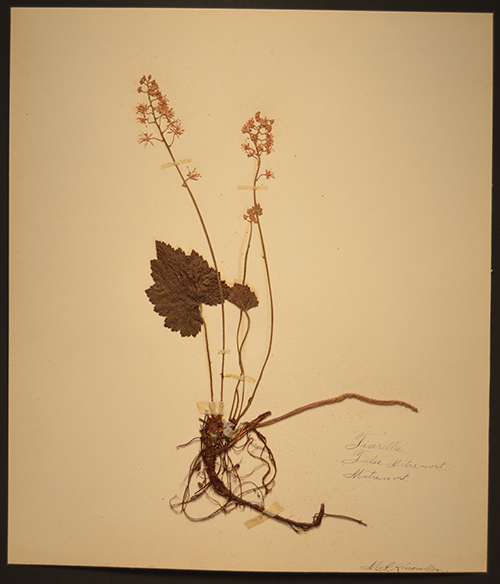 Are the Herbarium Flowers Still Around?